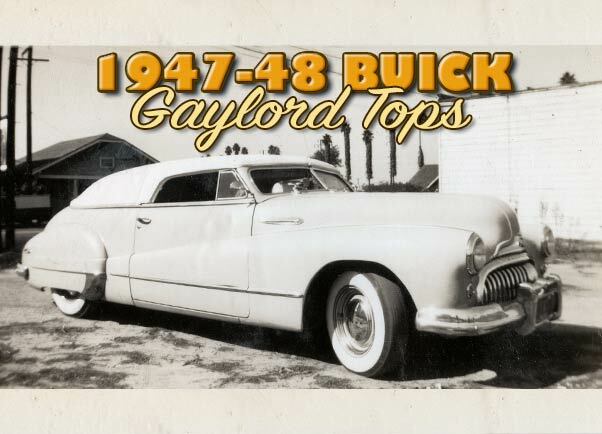 Bill Gaylord created a couple of stunning looking super long chopped padded tops for 1947-48 Buicks that completely transformed the looks of those cars. A closer look. 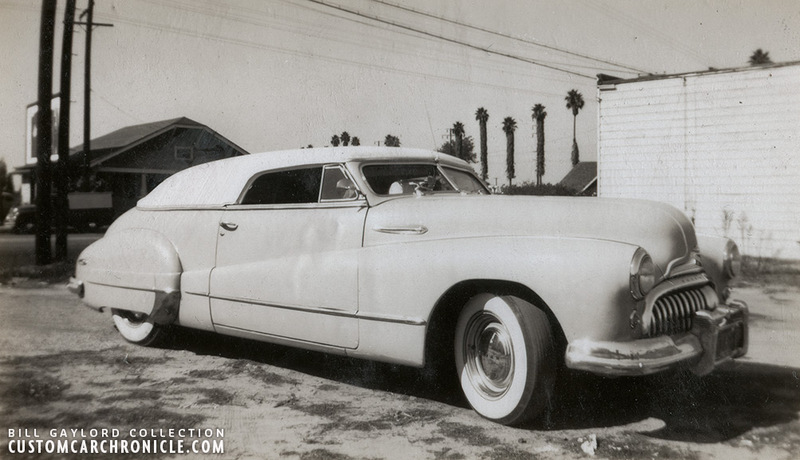 I was browsing thru some old photos to get some inspiration for a Digital Restyling project I was working on when I noticed the really long padded top, and especially the long rear quarters on the Buick in the opening photo from the Bill Gaylord Collection. It made me think of the Ben Mario and Don Vaughn Buick’s that were restyled at the Barris Kustom Shop, and both had similar shaped, but with panoramic rear window, Gaylord padded tops. 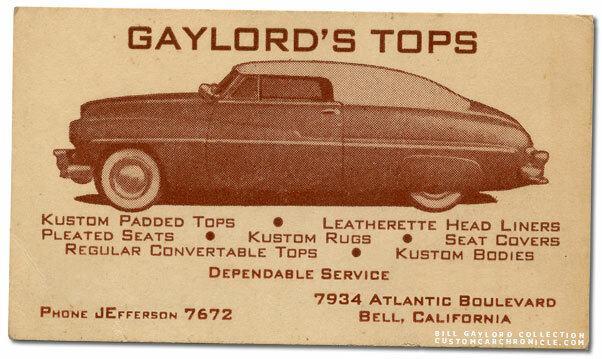 It also reminded me of the padded top Bill Gaylord did on George Barris his personal 1942 Cadillac, which had the same huge rear compartment that he covered with full length padded top with beautiful flowing shapes. 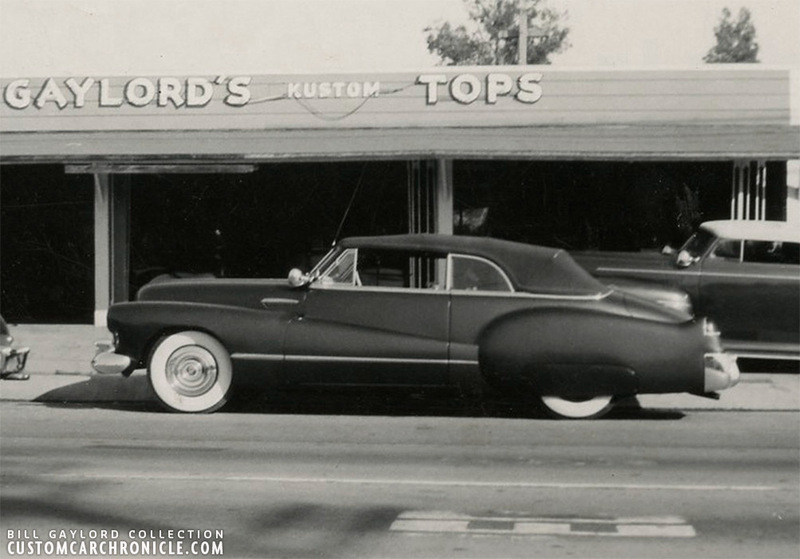 Bill Gaylord was a true artist when it came to smooth flowing shaped padded tops, and there was a reason that the Barris Shop took many of their streamlined Customs to Gaylord, instead of the Carson Top Shop. Carson was known for their slightly more boxy padded tops, very nice, and perfect on certain type of Customs. 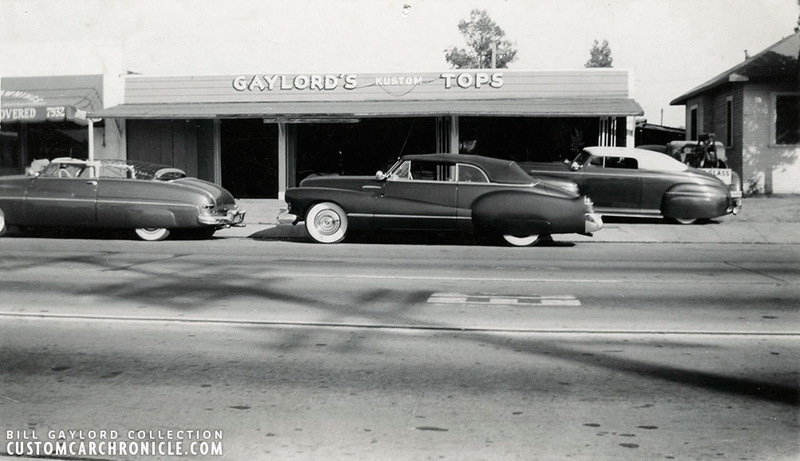 But when it came to the mid to late 1940’s GM cars, like the ’47-48 Buick’s in this article, the Gaylord Kustom Tops shop was THE place to go to. Stock 1947-48 Buick Convertible at the Gaylord Kustom Top Shop, possibly waiting to get the windshield chopped and a full padded top done. 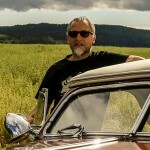 This photo shows the car with the stock folding top, and how the car original has a rear quarter window. Which makes the full length padded top look so special on these. The car is not the same one I think as the one below, notice the spotlight on the stock one, and non on the one chopped below. That is Bill’s personal chopped ’49 Merc behind the Buick. Close up of the chopped padded Gaylord top. Perfectly shaped, with beautiful flow of the rear of the top and the just right angle of the B-Pillar. 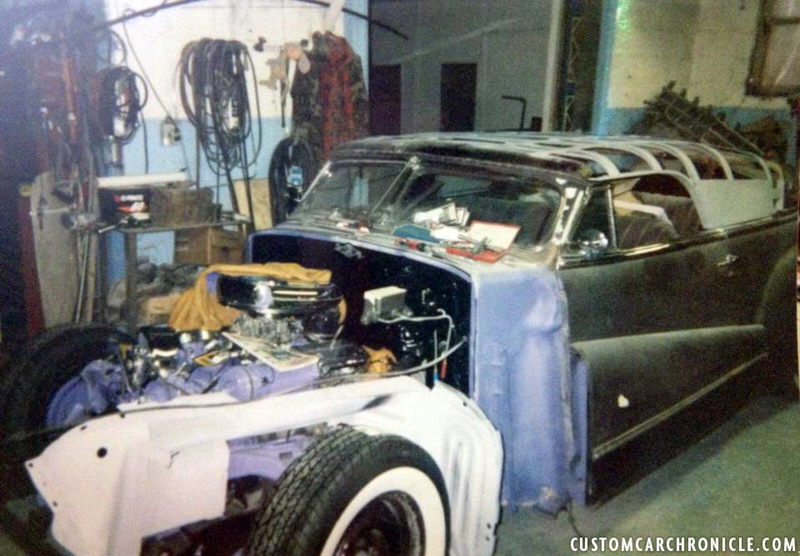 This is such a great photo showing Bill Gaylord’s personal ’49 Mercury with the chopped top still in progress, Ben Mario’s Barris restyled ’47 Buick with none buffed paint, or perhaps primer? with the top still at stock height, and Bill Gaylord’s personal ’41 Ford with super low padded top behind it. Close up of Ben Mario’s Buick from the photo above. Different photo, taken the same day as the one above shows the satin finish of the paint job on Ben Mario’s Buick. The guy all the way on the right looks a lot as a young George Barris. 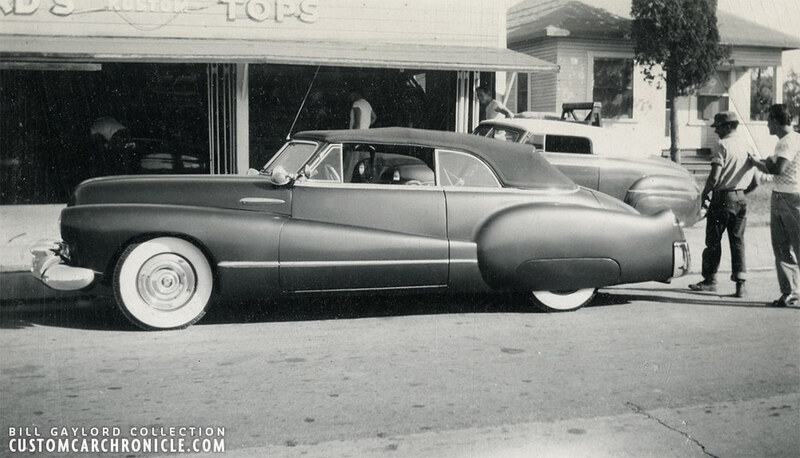 Ben Mario’s ’47 Buick was restyled at the Barris shop as a none chopped custom at first. The custom interior was done by Bill Gaylord. 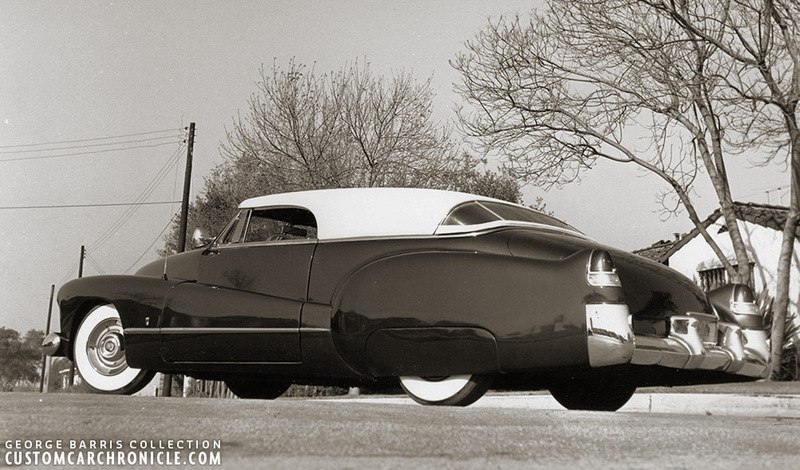 This photo of the car was taken later when the paint was completely polished, and a cover was added over the rear seat. Later the windshield was chopped on Ben Mario’s Buick and Bill Gaylord created a beautiful super long padded top with panoramic rear window. 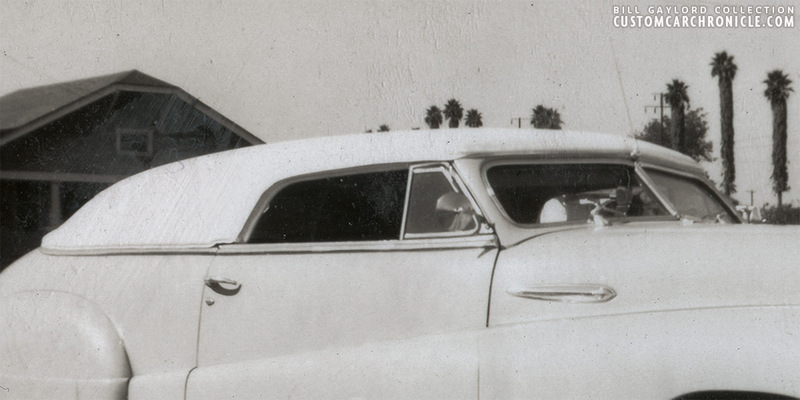 Ben Mario’s 1948 Buick photo that looks to be taken at the Hot Rod Show at the Los Angeles Armory, most likely in Jan 1950. 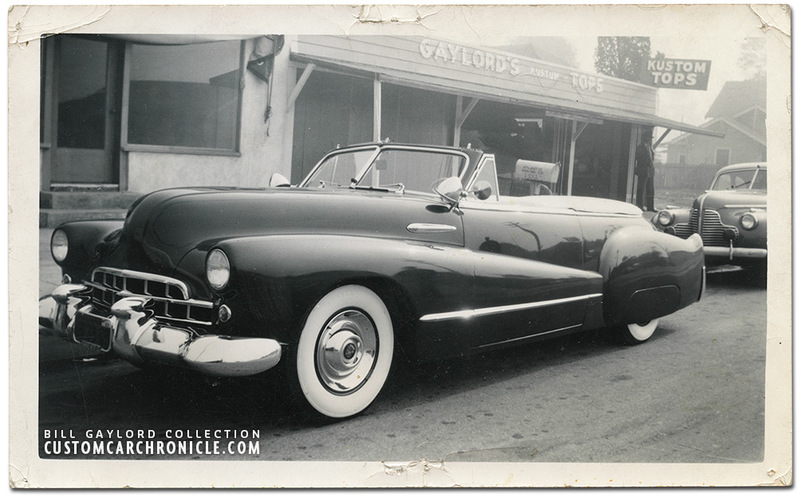 Notice that the sign behind the car reads Barris Kustom Shop Bell. 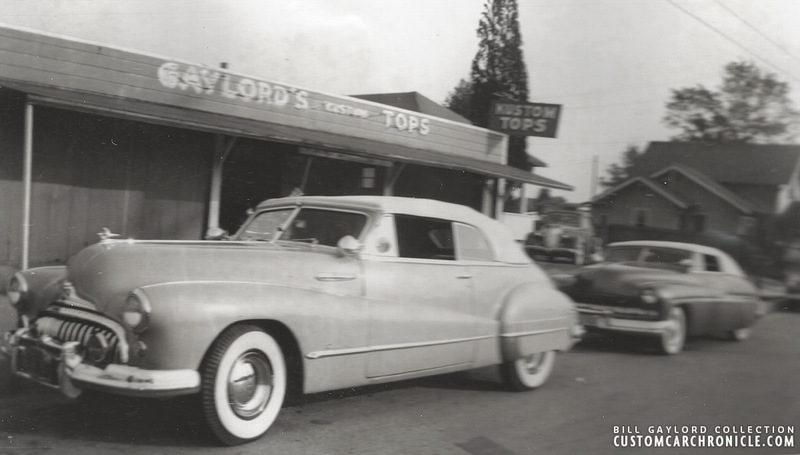 In March 1950 the Barris Shop moved to the new Lynwood Location. 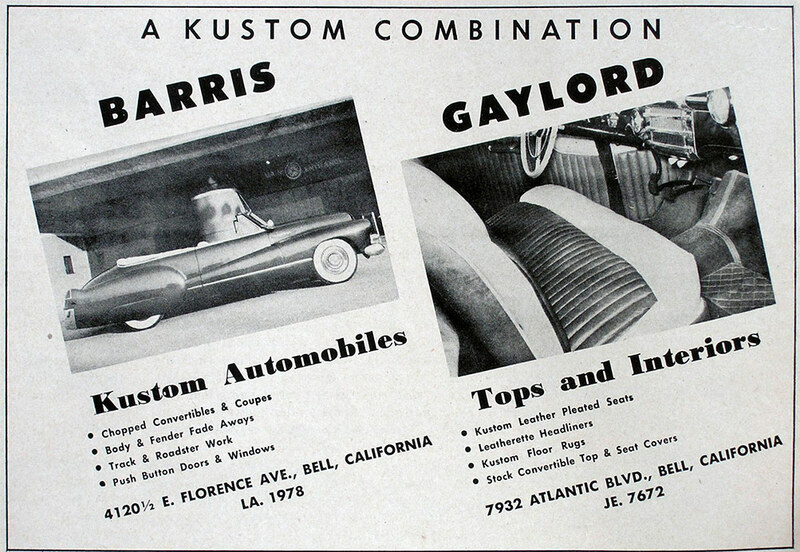 Barris and Gaylord advertised combined in Motor Trend magazine and the Ben Mario Buick was used to illustrate Bill’s Interior Skill’s and the Barris Shop’s body work and design skills. Sadly Bill Gaylord went into the military right when the magazine with this ad hit the newsstand, so there was nobody at the shop to welcome any new customers responding to the ad. 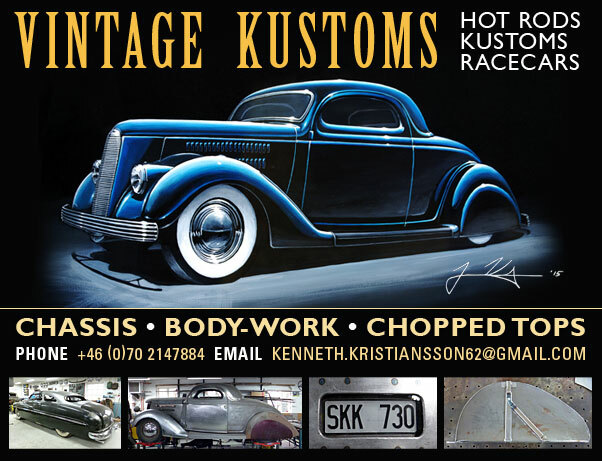 Don Vaughn’s Barris Restyled ’47 Buick. Notice the very round shape of the rear of the side window opening. Very different that the light colored Buick at the start of this article. Don Vaughn’s ’47 Buick might was very similar styled as Ben Mario’s Buick. And there are some stories around that mention the the Mario and Vaughn Buick’s are the same car. So far we have not been able to find any evidence for that, but the resemblance sure is remarkable. Close up of the Gaylord Panoramic rear window he added to the chopped padded top. The glass was made from shaped plexiglass. The flow of the top into the trunk is so nice on these Gaylord tops. They enhance all the Barris Restyled elements very well. 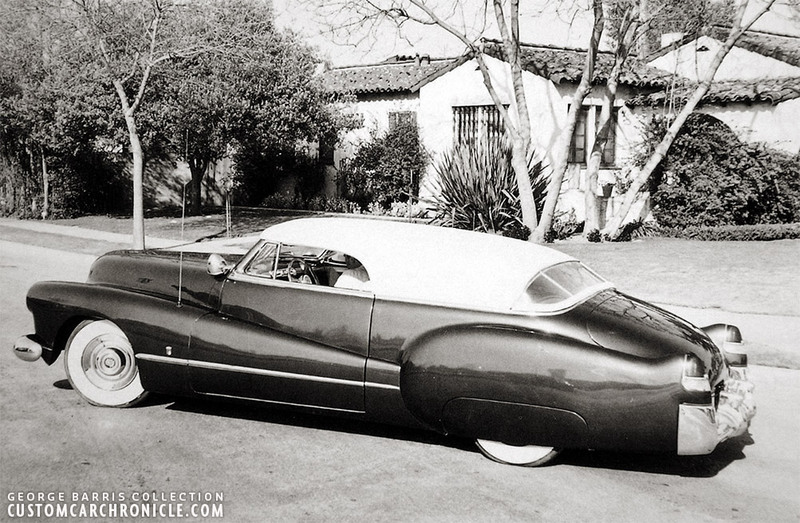 This possibly is the Ben Mario or Don Vaughn Barris / Gaylord restyled 1948 Buick. The photo was taken quite a few years ago, and we do not know where it is, or who owns it. 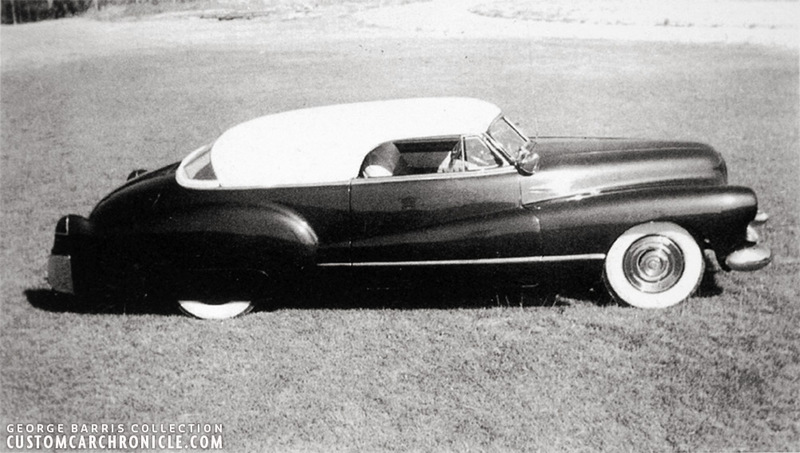 But the rumor is it is the original Barris Restyled Buick with the Gaylord created padded top frame in place. 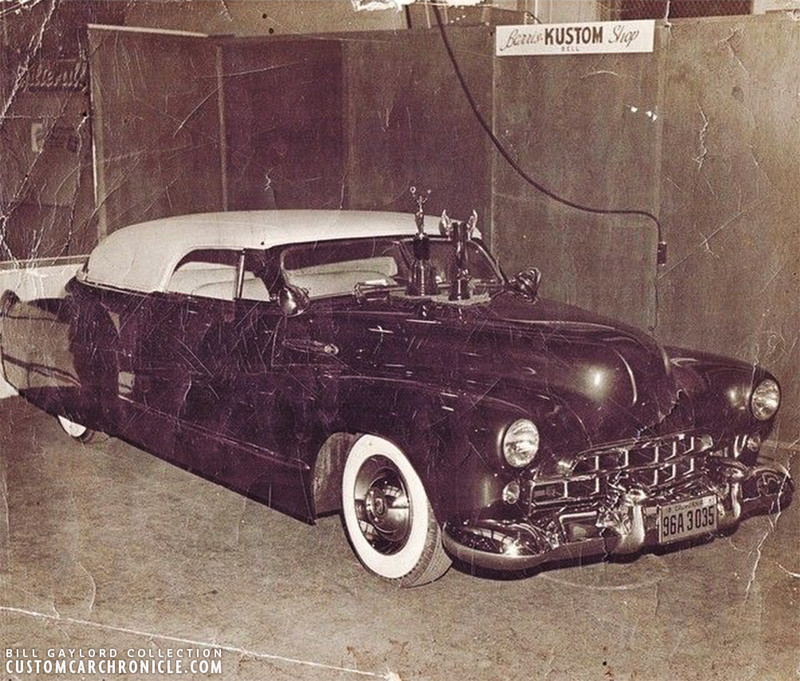 The one odd thing about the car in the photo is that it shows a door handle in place, which was shaved on both the Mario, and Vaughn Buick. Hopefully the future will bring more info on this mystery.